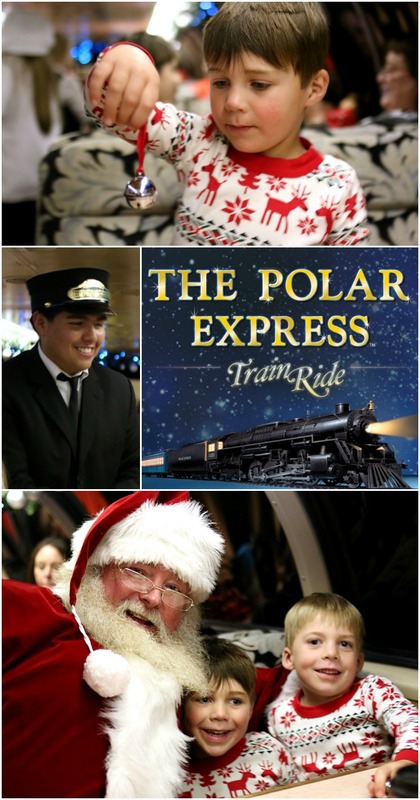 The Polar Express Train Ride - A Magical Christmas Experience! 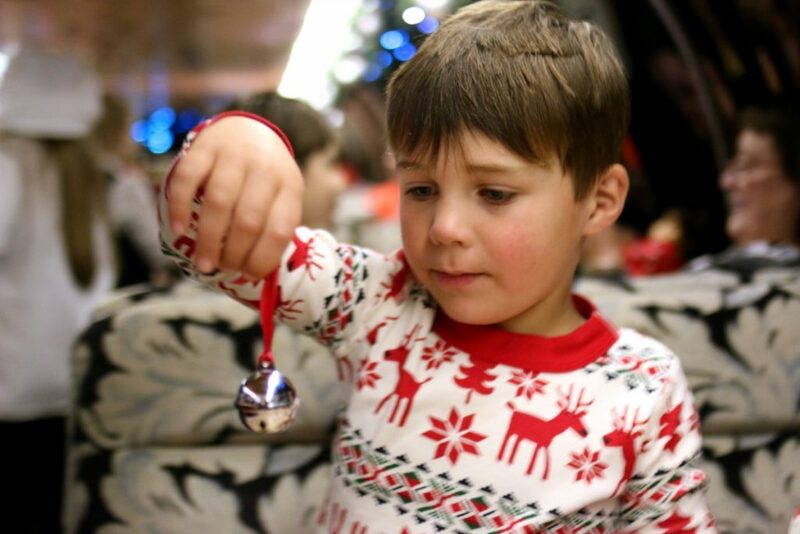 The Polar Express Train Ride – A Magical Christmas Experience! 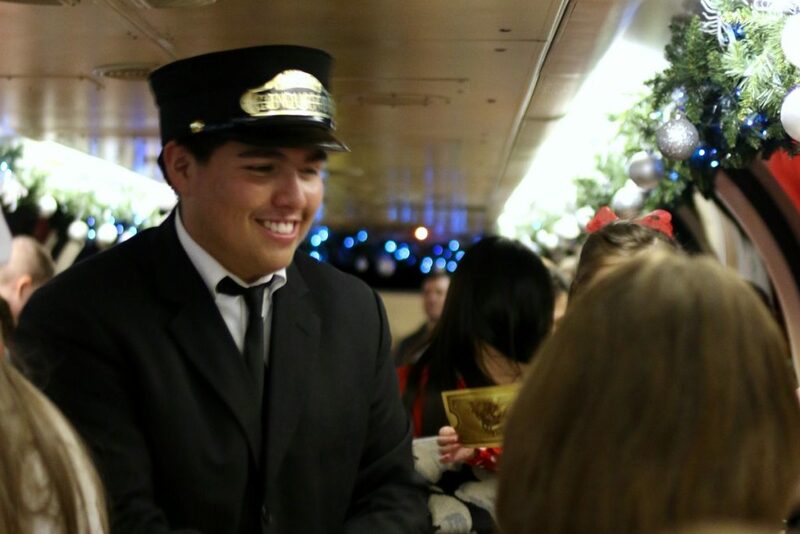 Hop aboard The Polar Express Train and take a magical journey to the North Pole! Have you ever read the book The Polar Express by Chris Van Allsburg? It’s one of my favorite Christmas books. The story is one of true Christmas magic and the illustrations make the story leap off the page. I don’t know about you but as a kid I always thought it would be so fun to ride the Polar Express Train. What if I told you that you actually can ride The Polar Express Train! 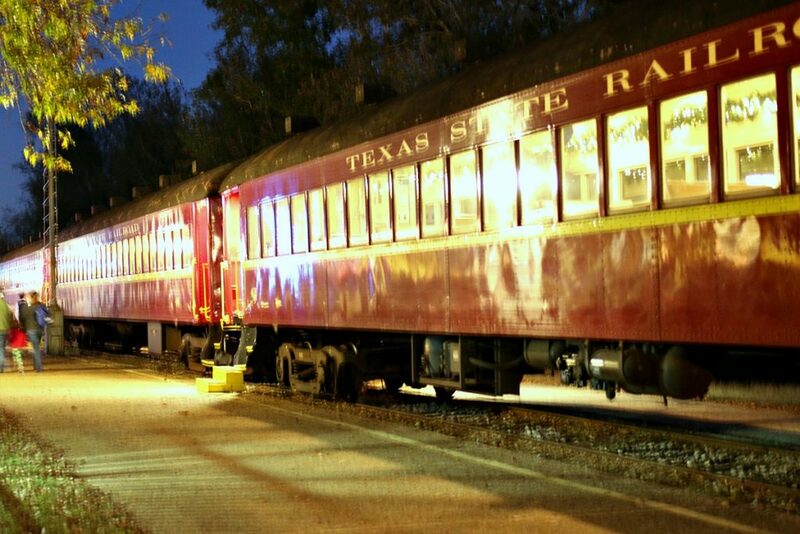 There are a few train stations around the US that offer a Polar Express Train Ride experience. And let me tell you, it’s magical! For my readers in Texas, we actually have 2 locations, one in Palestine and a second in Lubbock. However, for those of you not in Texas, there are locations in California, Colorado, New York and several other states. Find one near you! We were in East Texas this weekend for a family baptism and were pretty close to Palestine. 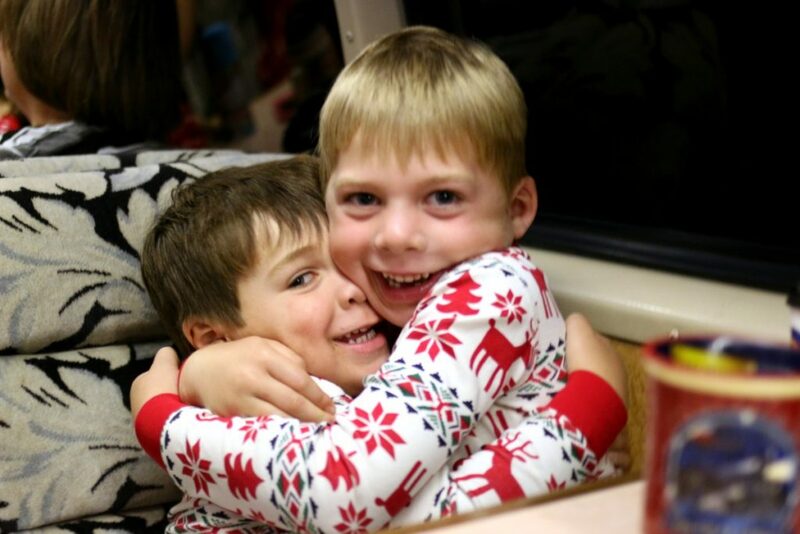 I jumped at the chance to finally take the boys on The Polar Express Train. I really think they were the perfect ages. They are barely 5 and newly 6 so the experience was absolutely magical for them and very memorable. The entire ride they were transfixed. I couldn’t stop smiling watching how happy and amazed they were! We had a cold snap at the beginning of the weekend. It was crisp and cold outside which really made it feel authentic. We took the 6:30 ride and arrived at the depot about 45 minutes early. The train whistle greeted us as we hopped out of the car. Since we arrived at dusk it was just light enough to see the steam rising into the sky and we got a pretty good look at the passengers cars. By the time we boarded (around 6:15) it was really dark and perfect for a nighttime ride! The Polar Express Train Ride has three different classes of tickets for the ride: Standard Class, Lone Star Class and Diamond Class. Every ticket come with cookies and hot cocoa and a visit from Santa. Standard Class has traditional bench seating. The Lone Star and Diamond Classes have climate controlled cars with seating in fours and a table in the middle. For these two classes, each rider can also take home a souvenir Polar Express Mug. The Diamond Class has domed windows and it’s in an upper car so you get a premium view of The North Pole. Once the train takes off, there are fun attendants like you see in The Polar Express Movie. 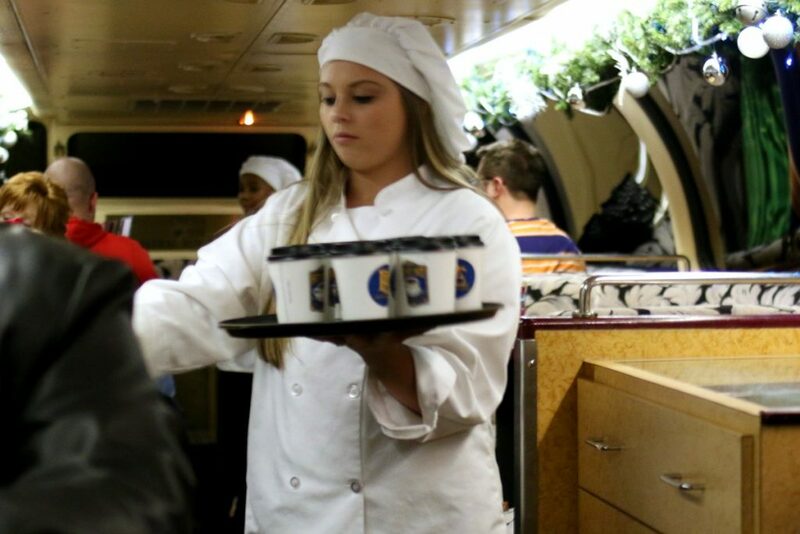 Some walk through the car and do a little Hot Chocolate dance while others hand out the cookies and hot cocoa. My boys thought it was so cool that they were dancing just like in the movie. Obviously it’s not as elaborate as the movie but it’s still very cute. 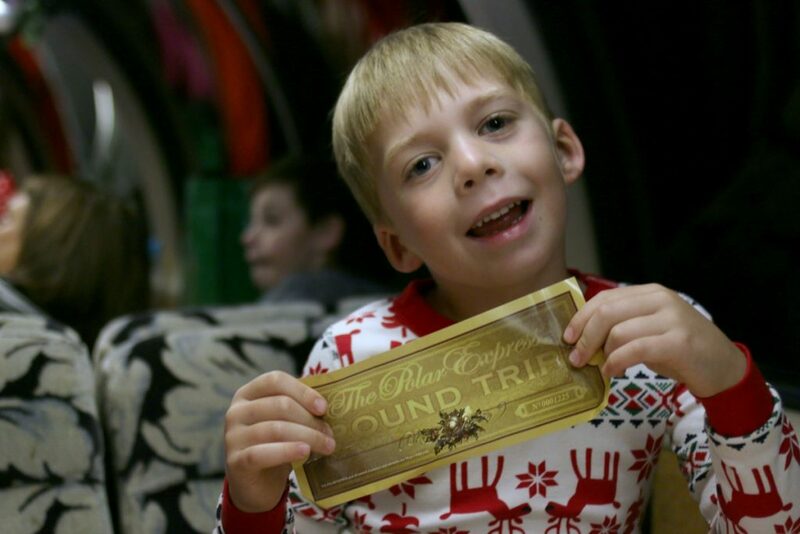 During this time, a hobo walks through the Polar Express Train and tries to steal Golden Tickets. Have your kids hold theirs tight! And don’t let them trade it away for his hat or scarf. The conductor also comes through and punches tickets. It’s not the cool message punches like they have in the book but my boys enjoyed it nonetheless. Then they play the audio book of The Polar Express, the version with Liam Neeson narrating. If you bring your book with you, you can follow along. If you forgot yours, the attendants have the huge classroom size books and they walk through the aisles as the story reads. Shortly after the story ends you arrive at The North Pole. It obviously not as elaborate as the book. My boys thought it was The North Pole’s train station and that Santa’s workshop and village lay beyond the station. There was a big tree and Santa was there waving. He had reindeer and elves with him. The train stops for a minute or two so you can get a good look and some pictures but you remain on board. 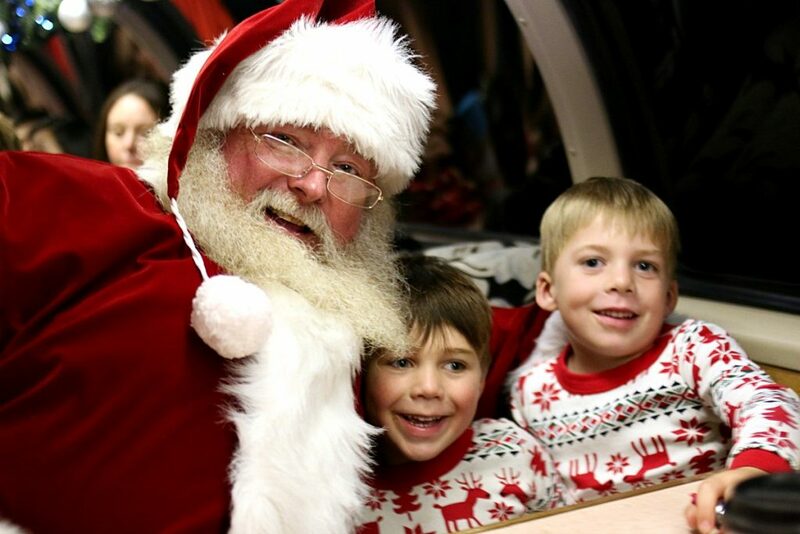 Santa hops on board as the train is leaving the North Pole. He makes his way through the cars and stops to ask the kids what they would like for Christmas. If your kids can tell him quickly what they want and don’t chit chat, he may have time for a quick photo with you. He gives each child a shiny, silver bell, just like in the book. The Polar Express Train returns to the same station where you departed. All in all it’s about an hour long journey. We had a fantastic time but I thought I’d share a few tips! Wear your PJs! 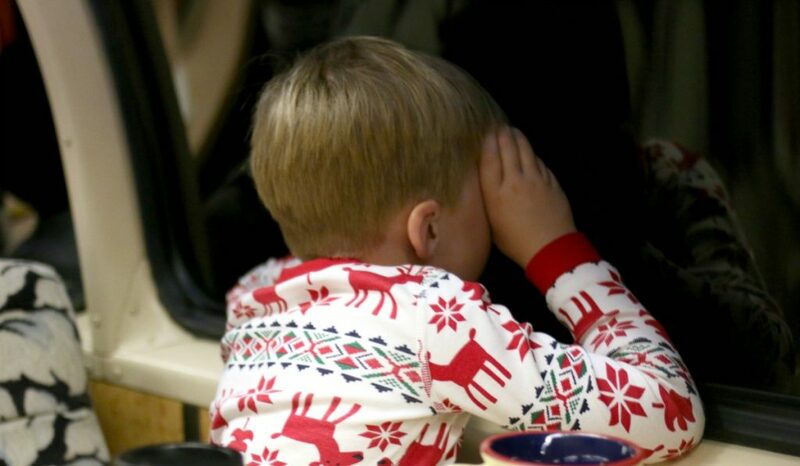 In the Polar Express book, all the children were in their pajamas on the train. Make sure yours are wearing theirs too! Use this as an excuse to get the cutest, most festive PJs you can find. My boys wore these from Hanna Andersson. You’ll also see many adults in PJs. I’d say about half the adults are in PJs and the others in regular clothes. Wear tennis shoes! You can bring slippers and change once you get in the train car but I would wear tennis shoes to walk around the depot and board the train. It’s rocky near the tracks and the stairs can be a bit steep and slick, depending on your car. Be safe and wear real shoes. Be there at least 30 minutes early! The Polar Express Train departs at the stated time and begins boarding about 15 minutes before departure. Parking for us was about a 5 minute walk. Add in time to collect your tickets and look around. I would recommend about 45 minutes to give yourself enough time. For depots other than Palestine, call ahead to see what they recommend. Bring a blanket! For the Palestine train, the standard class does not have climate controlled cars. If it’s a chilly night, you might want to bring a blanket to wrap up in. That’s a little more photo friendly than winter coats and would keep everyone warm. Bring your Polar Express book with you! If you bring your book, you can read along on the train ride. You can also ask Santa to sign it when he passes through the car. Pick a side! For our ride, the North Pole was on the South side – the opposite side from where we were sitting. The train stopped at the North Pole and my kids were able to see Santa and his elves just fine. However, when you reserve your tickets you might see if you can request the North Pole side of the train. We had the best time and I know this will be one of those priceless experiences that the boys will remember for years to come. 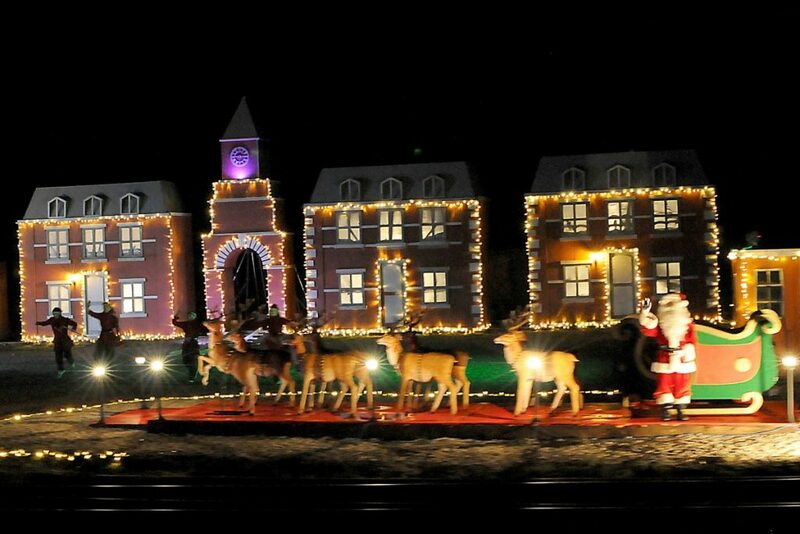 If you are looking for something magical to do this Christmas, look into the Polar Express Train ride. I know you will love it as much as we did. 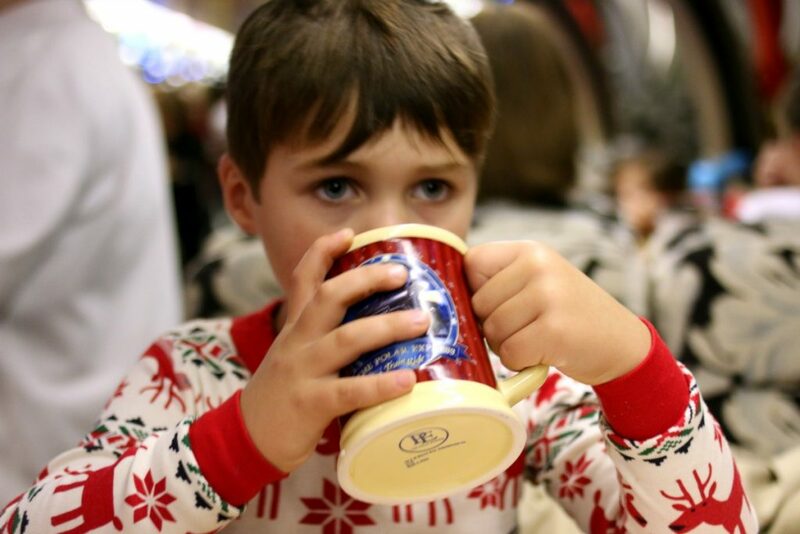 *Disclosure: Although The Polar Express Train hosted our family for this ride, the thoughts and opinions in this post are 100% mine.